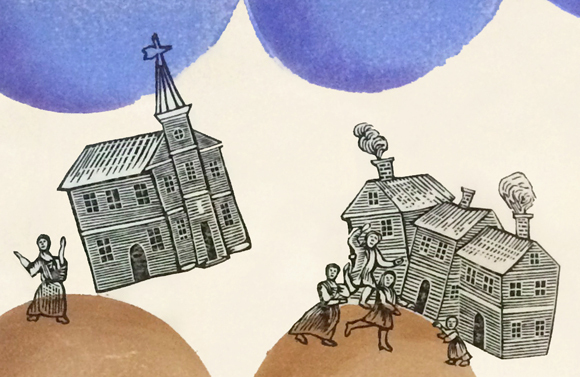 The final addition to this print is a reproduction, carved on shina plywood, of an illustration I found at American Antiquarian Society in a small 1748 book called The History of the Holy Jesus. It was used in that book to illustrate a Bible story (the second coming perhaps – I can't recall), but many references to this illustration call it an illustration of the Boston earthquake of 1727, probably the worst earthquake ever to strike New England. This re-use of illustrations for various unrelated purposes in colonial printing was very common, and printers often copied one another's illustrations, sometimes quite poorly. I've been using history in my work for quite a while now, but my fellowship at American Antiquarian Society this past spring deepened my relationship with history even more. It was like four weeks of time travel during which I realized once again that history is something that we stand on. We are inextricably connected to it. It lives in layers under our feet, it courses through our blood, and it is present in our thoughts and conceptions of the world. Sometimes history haunts us. Sometimes history rises up seeking justice. These little Puritans can feel the quake, but are unaware of exactly what it is that's shaking their world so. 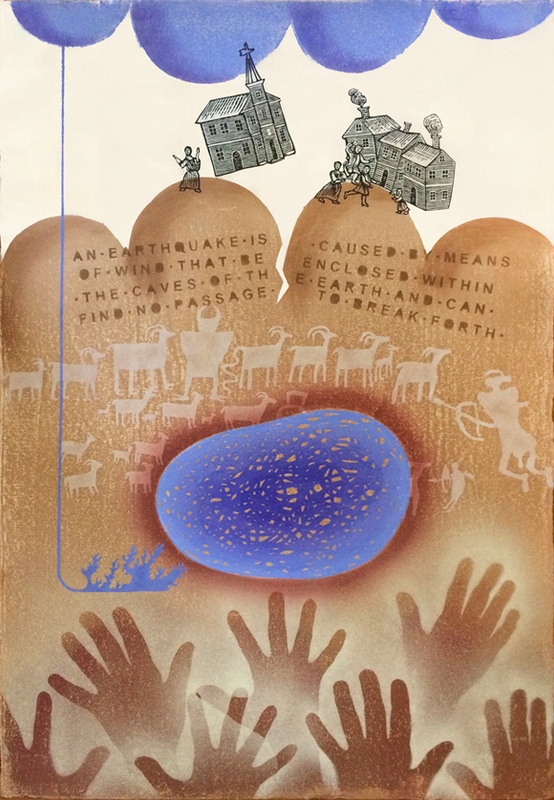 This print is a riff on a 1767 definition of earthquakes that states, An earthquake… is caused by means of Wind that be enclosed within the Caves of the Earth and can find no passage to break forth. So I decided to make a cave full of wind. And then I decided to have some fracking going on, because everyone these days is worried that earthquakes can be caused by fracking. Which makes sense to me. But so does the idea that wind gets trapped inside the earth and has nowhere to go. 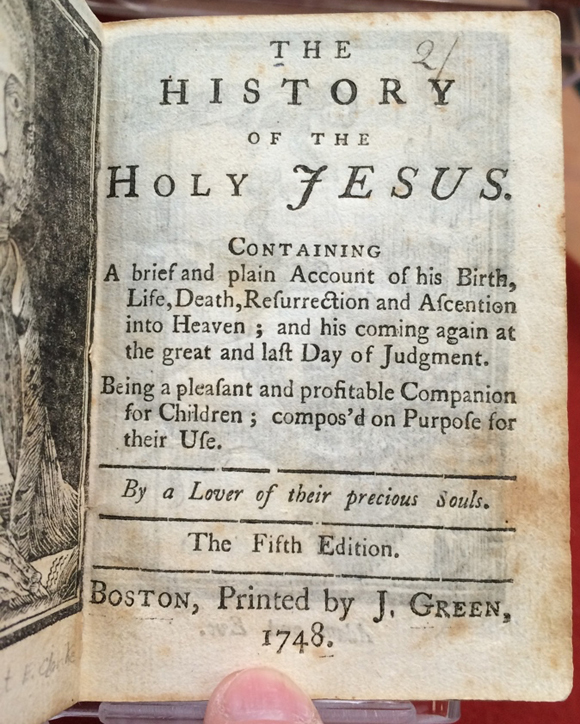 Now I have a little more carving to do — an illustration I found at American Antiquarian Society in a small 1748 book called The History of the Holy Jesus. Check out the photo below for the full title and author attribution of said book. 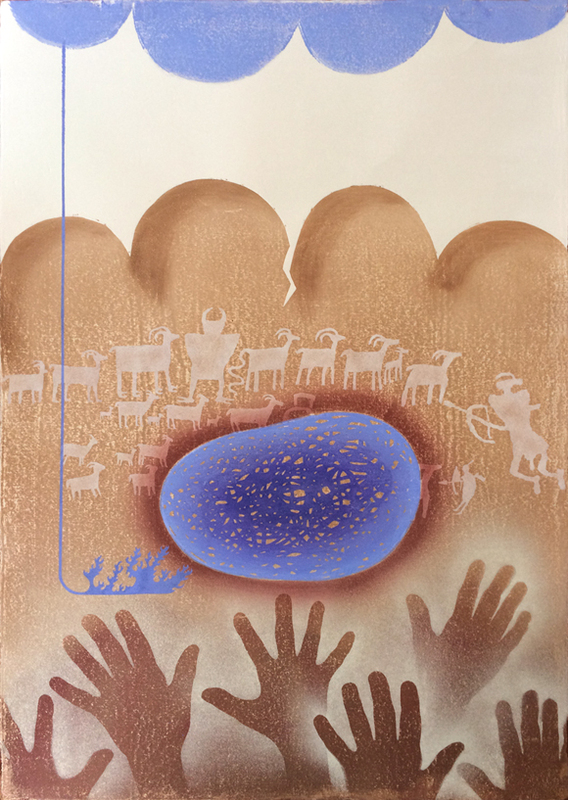 Handprint pictographs, formed by either inking up one's hand and pressing it against a surface or else by placing one's hand on a surface and inking around it, are found all over the world. 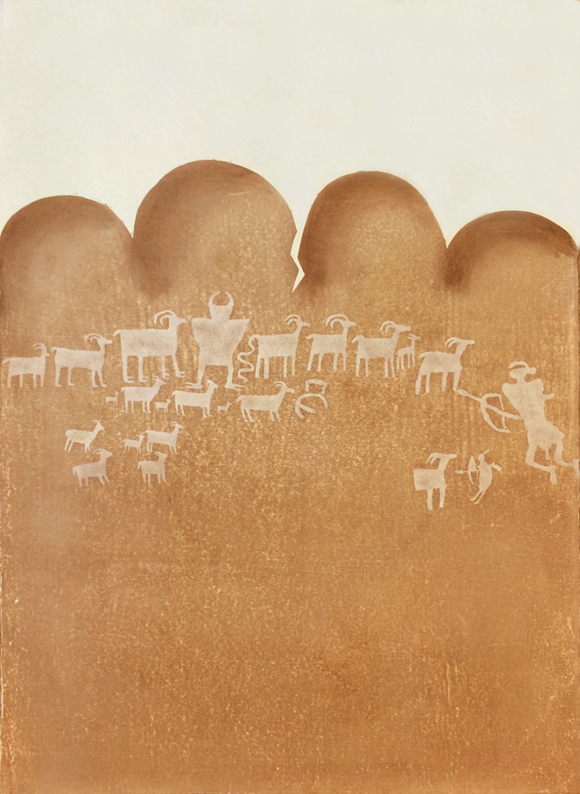 These pictographs are probably one of the earliest forms of printmaking. 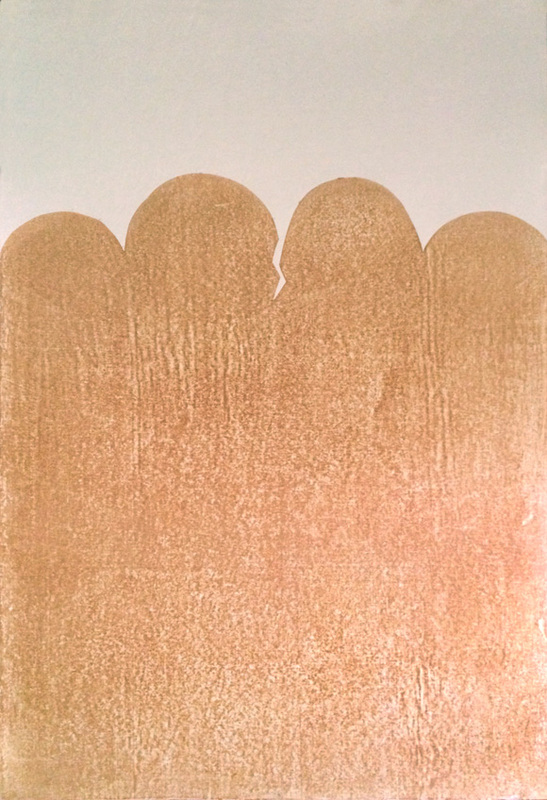 I used my own hand and my partner's and spattered the ink with a toothbrush to make the handprints above. Next element for the print: a cave. Since my last post about this print, I've added a few layers and elements. 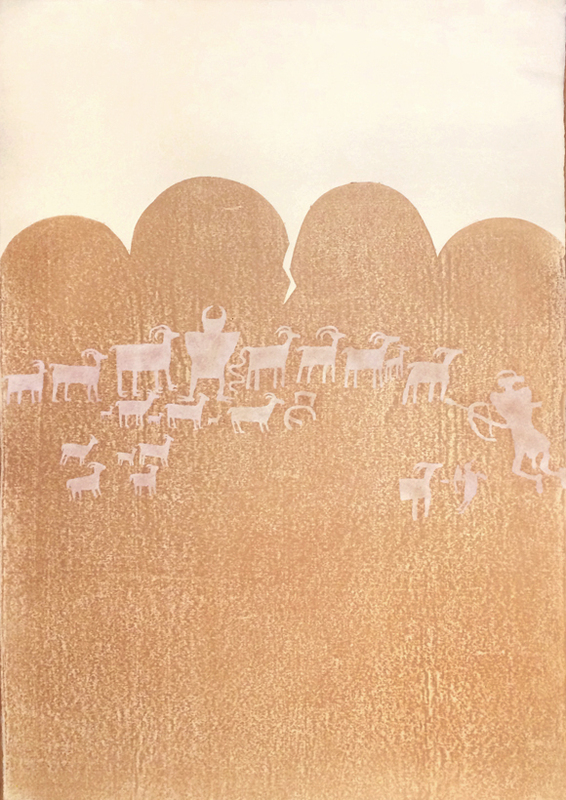 These petroglyphs were stenciled onto the paper using a hand cut stencil with titanium buff pigment. Then I felt that the background still needed work, so I added more brown pigment — a bokashi at the bottom and some modeling of the "hills." Now I'm ready to add some new elements. 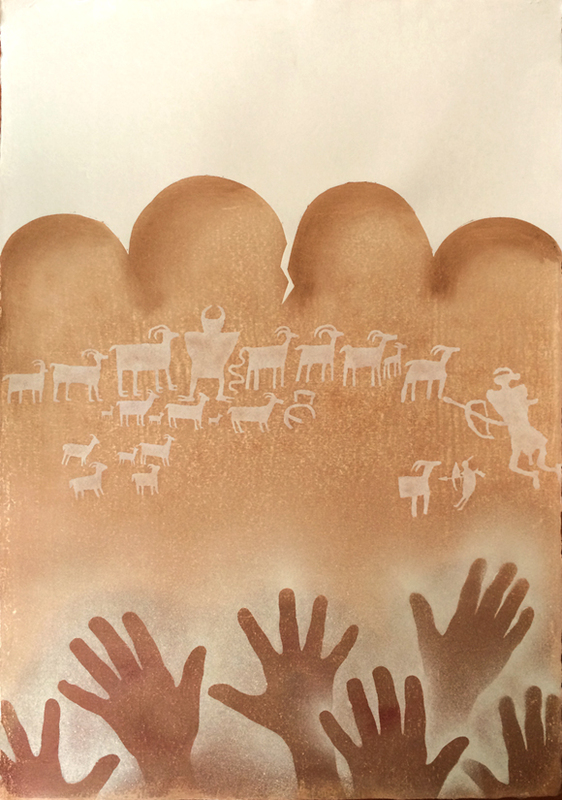 Note added 14 Jul 2015: Petroglyph stencil based on "The Great Hunt Panel" at Nine Mile Canyon in Utah, USA. An earthquake… is caused by means of Wind that be enclosed within the Caves of the Earth and can find no passage to break forth.